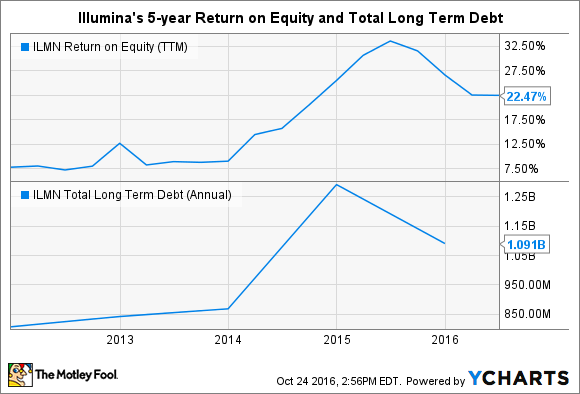 Is Illumina Inc. a Buffett Stock? How does the genomic sequencing specialist stack up against Buffett's acquisition criteria? Warren Buffett keeps tens of billions of dollars in cash on Berkshire Hathaway's (NYSE:BRK-A) (NYSE:BRK-B) balance sheet so he can swoop in and make a sizable acquisition at any time. We saw him do just that in 2009 when he spent $44 billion to buy the railroad giant Burlington Northern. Buffett struck again late last year when he ponied up $37.2 billion to acquire Precision Castparts. So what stocks are likely to be on Buffett's shopping list right now? With that in mind, we can stick to using Buffett's first five criteria to determine if a stock could potentially be on his shopping list. Let's see how the genomic sequencing giant Illumina (NASDAQ:ILMN) stacks up against his checklist. With tens of billions of dollars to invest, Buffett can no longer move the needle at Berkshire by making small acquisitions. He has also stated that he is not interested in buying any company that is unprofitable. That's why his first requirement is designed to whittle down the pool of applicants to companies that are both big and highly profitable. Illumina passes this first test with flying colors. The company has been selling its gene-sequencing machines for more than a decade, and its razor-and-razor-blade business model brought in more than $2.2 billion in total sales in 2015; that allowed the company to produce more than $583 million in earnings before taxes. Buffett greatly favors investing in businesses that can grow their earnings through all economic conditions, so he likes to look for companies with a long history of growing profits even during times of market stress. While the company has been solidly profitable over the last five years and should continue that trend into the future, it is not clear to me that Buffett would be willing to overlook Illumina's profit dip in 2008. ILMN Return on Equity (TTM) data by YCharts. Illumina's return on equity has soared recently as its business has started to scale, but the company has taken on more than a billion dollars in long-term debt to get there. Thankfully, Illumina's highly profitable business model allows it to easily cover its interest expense, and it holds more than $1.4 billion in cash on its balance sheet, giving it a net cash position. My guess is that Buffett would be willing to give the company a green light here. While Illumina's current CEO Francis deSouza only took over a few months ago, he certainly seems like the right man for the job. He joined Illumina in 2013 as President, where he oversaw product development. Prior to joining Illumina he also spent years as an executive in the tech industry, which included a time period where he co-founded and lead a company that was ultimately acquired by Symantec. In addition, Illumina's former CEO Jay Flatley still plays an important role in shaping the company's future. Flatley led the company from 1999 until deSouza took over in 2016, during which time the company's revenue grew by 64% annually. He currently serves as Executive Chairman of the Board, and he also chairs two of Illumina's exciting subsidiaries, Helix and Grail. Shareholders look like they are in good hands with these two leaders at the helm, so Illumina passes this test. Buffett is famous for avoiding businesses that he doesn't understand, which is why he primarily invests in companies with simple business models like candy makers, newspapers, insurers, and home builders. As a leading provider of genomic testing equipment, it is hard to call Illumina's business "simple". In essence, the company makes its money by selling its expensive gene sequencing machines to researchers around the world. Illumina's customers also need to regularly purchase consumables products and services from the company in order to run their tests, providing the company with a predictable stream of recurring revenue. While there are plenty of reasons to believe that the demand for genomic sequencing will continue to grow in the years ahead, my hunch is that Buffett would have a hard time understanding how this company is going to be able to win over the long term. After all, Pacific Biosciences of California (NASDAQ:PACB) now looks like a more formidable competitor and the market is rapidly evolving. It is not hard to image that a technological advancement could eventually come along and disrupt this entire industry, which is why it is so hard to identify the winners ahead of time. That fact makes me think that Buffett would put this company in his "too hard" pile. 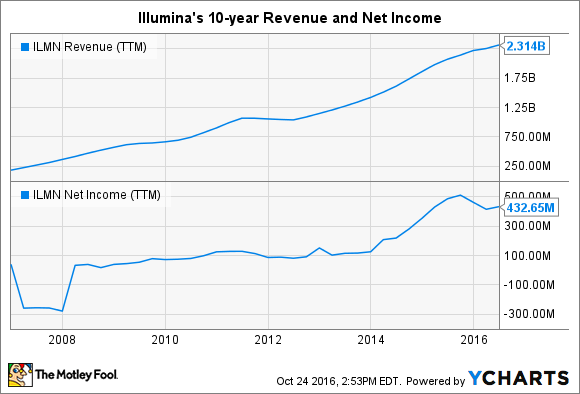 Is Illumina on Buffett's buy list? By my math, Illumina scores a three out of a possible five on Buffett's checklist. Since he would have to risk tens of billions of dollars to buy the company outright, I have a hard time believing that Illumina would ever make it on his shopping list. Of course, just because Illumina might not appeal to Warren Buffett doesn't mean that it isn't worth owning. After all, Illumina remains the leader in its industry, and management believes that the genomic testing market could eventually exceed $20 billion in annual sales. That number could go far higher if Grail or Helix ultimately pay off, too. If Illumina can successfully execute against that opportunity then buying shares at today's discounted price could be a profit-friendly move.